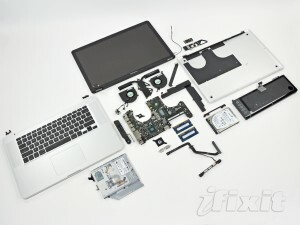 MacBook Pro 15″ Unibody 2011 disassembled! | It-11 Audio / Tonegeek"
MacBook Pro 15″ Unibody 2011 disassembled! The iFixIt team has already dismantled the new Apple MacBook Pro 15″ on February 24 ! This new Apple MacBook Pro has a quad-core processor and a brand-new I/O technology with a Thunderbolt port. The Apple MacBook Pro 15 and 17 now feature Intel Core i7 processors Quad Core. The Apple MacBook Pro 13 have dual-core Intel Core i5 and i7 processors. These three models are up to twice as fast compared to previous MacBook. And Thunderbolt technology is the next generation of high-performance I/O connection : more than 12 times faster than FireWire 800 and 20 times faster than USB 2.0 ! This entry was posted in What's up, doc ? and tagged apple, Macbook Pro, thunderbolt. Bookmark the permalink.